By now, we all know that the ace cricketer Yuvraj Singh got engaged to the beautiful Hazel Keech. Their wedding has been scheduled for November 30 this year in Chandigarh.Recently, the couple’s uniquely designed wedding card found its way to the internet. The card, which has many caricatures of the couple on it, looks extremely adorable because of its unique content. The card has been titled as ‘Yuvraj Hazel Premier League’. 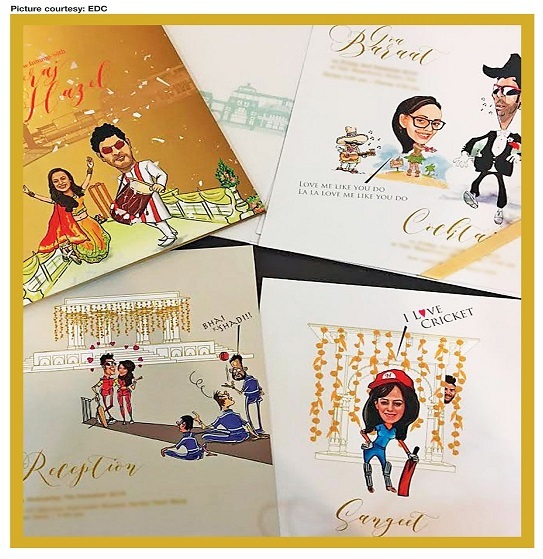 The wedding cards have been conceptualised by designers Sandy and Kapil Khurana.When asked about the venue of the wedding, Yuvraj Singh’s mother Shabnam Singh chose not to reveal fearing the rush of fans and media. The family and guests of Hazel Keech are reportedly expected to come over from Mauritius and UK.